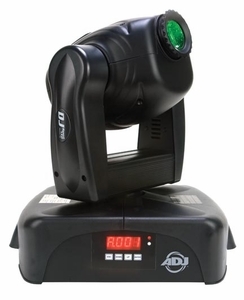 The DJ Spot LED is a compact Intelligent Moving Head fixture with a 25W Surface Mount Diode (SMD) LED source. With the advances in technology, American DJ now offers higher output with the same quality and affordability that comes from our range of DJ lighting products. The DJ Spot LED is a �WIN-WIN-WIN� in terms of performance: It''''s 25W LED source offers a 50,000 hour life, the power consumption is only 50-watts, and the unit stays cool so it may used all night long! 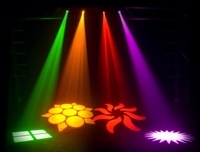 The DJ Spot LED offers 7 colors + white and 11 gobos + spot on separate color & gobo wheels; a 4-Button LED DMX menu system; and three operational modes (DMX controller, Master/Slave or Sound Active). The DJ Spot LED is compact and light-weight making it great for mobile entertainers on the go or for permanent installation. � Runs extremely cool! - NO Duty Cycles! - Run all night! � Weight: 20 lbs. / 9 kg.